Colder weather is here; that means I can finally start enjoying whiskey cocktails, outdoors. We took a trip out to Joshua Tree for the weekend, and i needed a drink fit for the weather and the desert. Rye and thyme fit the profile. 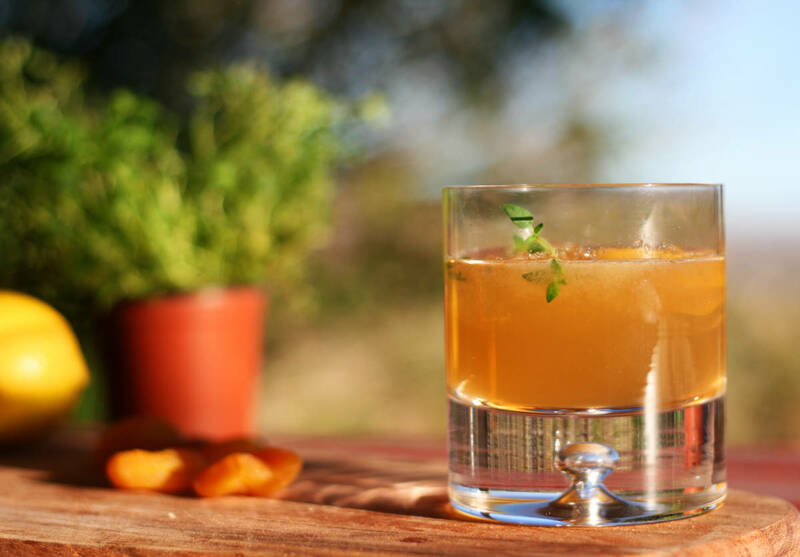 This is a perfect autumn cocktail that brings out the rye while blancing the sweet, the sour, the fruit and the herb. In a cocktail shaker filled with ice, shake whiskey, apricot liqueur, lemon juice, and honey thyme syrup. Strain into a old fashioned (rocks) glass with an ice cube. Bring, in a 1 qt. sauce pan, 1⁄3 cup of water to boil. Stir in 1⁄3 cup of honey. Stir until it is fully dissolved. Add thyme. Cover and let it stand for 30m to an hour. Strain the syrup and save.